What lengths would one go for love…or in war? Cataclysmic outside events thrust unlikely people together…torn from their privacy to create new intamicies…in secret…but in service for something larger…a delicate, romantic spy game that could determine the fates of strangers in strange lands just as much as it could the fate of the ones you most love. In his masterpiece The English Patient, Canada’s titan of literary fiction, Michael Ondaatje described a novel as a “mirror walking down the road.” In his latest novel, Warlight, which mirrors many of the themes of his best, he describes a memoir as “the lost inheritance”. 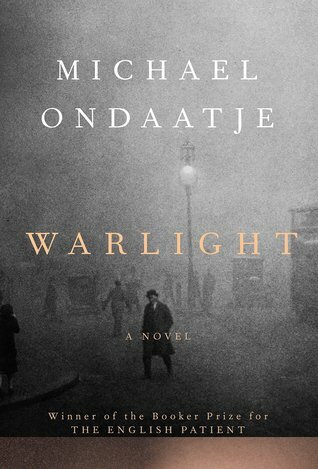 Warlight is a novel written as if it was a memoir, and the light it casts on the shadowy lives of those left picking up the pieces in the aftermath of World War II will leave one shaken as equally by Ondaatje’s craft as by the fates of the characters. It would make a cracker jack film or miniseries, you know, if someone skillful enough could dissect it, reassemble it, and focus the whole thing on the shocking soap opera-like revelation at the end…the twist of fate…the sad realization of what the consequences of one’s actions and youthful indiscretions could be. The first half of the novel is effortlessly thrilling, told mostly from the point of view of a 15 year-old British lad named Nathaniel living in post WWII London, who along with his older sister Rachel has been abandoned by his parents, who allegedly were moving to Asia for his father’s new job…but as it turns out were on the lam evading the vengeance of those whom their spy games during WWII ruined. Originally intended to be off to boarding school (which they only briefly attend), they are left in the care of odd friends of their parents…shady characters with nicknames like The Moth and The Darter, who in the past were recruited to perform crimes in the name of the war effort, and are now regulated to things like protecting their former cohort’s children and illegal greyhound smuggling. Curious and wandering and wondering, Nathaniel soaks up the independence and the danger, eventually skipping school to start odd jobs (first legal..then illegal), reveling in the tales of those he befriends on the periphery of society, and falling in love with a waitress with whom, among many other activities, he spends time with wandering and cavorting in the abandoned post wartime homes her brother, a real-estate agent, is trying to flip. The dark, damaged, empty homes serve as mirrors into the young lovers’ hearts…large, desiring to be full, riddled with the holes and wounds of war and family. Nathaniel remembers her later only as Agnes, but it was a play name…did he ever really know her real name? His mother’s name was Rose…but it was her code name Viola that haunts those who desire to determine her fate. The first half of the novel comes to a violent, sudden end, and the rest is a meandering recollection of an adult Nathaniel, now working for government intelligence as a records eraser, as he returns to his mother’s childhood home, and, through his job and the environs, pieces together the fragments of her past that led to her becoming a spy who could never fully leave the game. It all seems to be going nowhere, until that melodramatic revelation…ahh the twist. And it’s delicious in its brevity…Ondaatje pulling out the rug from under us, from Nathaniel, and quickly returning to the same quiet, thoughtful, tortured melancholy of those left forever scarred by both the actions of others, and their own, in love and in war. Ondaatje is such a conjurer of dark poetic indelible moments and strange beautiful metaphors. When the guardian named The Moth, his face bathed in the red lighting of the gas fire, is telling the sad tale of a singing cat to young Nathaniel, it’s as you are there in the scene…feeling the warmth…the dread…and pining for that poor cat. Later he makes you ponder the strange companionship of rescued greyhounds, and the resurgence of the sea pea, once near vanished, thriving now on in the shallows of a mine-laden beach left untouched by human feet. The memories of war and its aftermath, perhaps, are the mines, buried…covered now by beautiful lush sea peas…by the poetic half-lit lens of those piecing together the shattered glass of their communal pasts…by Ondaatje’s lushly romantic prose. Yet they lay in wait, still dangerous…ready to explode at the slightest human touch. This entry was posted in Book Reviews, Books, Language, Literature and tagged Fiction, Fictional Memoirs, Literary Fiction, Memories, Michael Ondaatje, Novels, Post WWII London, Romance, Spies, Twists of Fate, War, Warlight, WWII. ← From Whence Did This Beast Spring?